Known as the world’s toughest footrace, runners had to cover the equivalent of five and a half marathons over six stages. Starting Sunday (April 7th), men and women of all ages from nearly 50 countries had to cover the equivalent of five and a half marathons over six stages — including a non-stop leg of some 75 kilometers (46.6 miles). The race is a grueling six-day adventure through a formidable landscape in one of the world’s most inhospitable climates – the Sahara desert. The ultra-marathon is open to both amateur and elite runners, competing as individuals or teams. Places are much sought after, with 1017 runners taking part this year. Competitors have to be completely self-sufficient and able to carry everything they need on their backs, except the water they need to survive the challenge [and a tent to sleep in at night]. Haylee Smith, 14, and her sister, Hannah, 16, of Lebanon, Ore., lifted a 3,000-ton tractor off of their father after it fell on him. 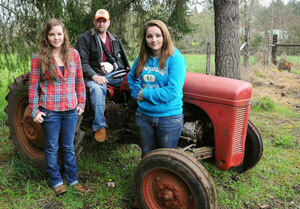 Two teen sisters in Oregon tapped into some hidden superhuman strength when they lifted a 3,000-pound tractor off their father after a freak accident at their home. Jeff Smith, a 36-year-old from Lebanon, more than an hour south of Portland, was aboard a tractor trying to pull a tree stump from his yard when the machine suddenly flipped, pinning him to the ground, the Albany Democrat-Herald newspaper reported. His daughter, Haylee, 14, told the newspaper she and her sister, Hannah, 16, had just returned from school when they heard their father’s panicked cries for help. “We heard, ‘Save me. Help me, God,'” Haylee said. The two ran over and found the tractor crushing their father’s chest. Smith said it felt as though the life was being squeezed out of him. Jeff Smith, 36, was trying to remove a tree stump from his yard when the tractor flipped over and fell on him. “I was losing more and more breath every time I screamed,” he told the newspaper. After calling 911, the pair hoisted the tractor enough for him to get his torso free. Hannah fetched a neighbor, who used his own tractor to pull Smith out. He was taken to a local hospital, where he was treated for a broken wrist and other injuries. The teen girls said it was a stroke of luck they were home when the accident occurred because they had planned to go to a friend’s house after school. April 4, 2013: sheep used in replacement of lawn mowers graze the lawns at a truck warehouse at Evry, south of Paris. Will tourists soon see flocks of baaing sheep at the Eiffel Tower and bleating ewes by Notre Dame cathedral? That could be the case, since Paris City Hall last week installed a small flock of sheep to mow the lawn at the city’s gardens, replacing gas-guzzling lawnmowers. Four woolly ewes — shipped in from an island off the Brittany coast — are currently munching the grass surrounding Paris Archives building. The number of sites doing that could expand in and around Paris. The ovine-operation follows a successful stint last year by two goats that were hired privately by the Louvre to mow the lawn at Tuileries, central Paris’ grand 17th-century gardens. Motorless and independent, the four-legged workers contentedly munch day and night — oblivious of the France’s strict 35-hour work week. A similar experiment in a park outside Paris even found that sheep droppings were a benefit, bringing swallows back to the area. The City Hall initiative was inspired by a handful of private French companies that have been hiring sheep and goat lawnmowers for quite some time. Alain Divo is the director of one such company, Ecoterra, whose goats worked at the Tuileries last summer. He said having animal lawnmowers is great for biodiversity. “We installed some at the Parc des Sceaux (a famous park outside Paris), where the swallow population had completely disappeared. Because the droppings attract small insects, the swallows all came back in two years,” he said. Some Parisians may worry that sheep droppings could ruin their pristine City of Light. But Divo said goat and sheep droppings crumble away in days to an odorless, inoffensive powder that serves as potent fertilizer for the grass. Another company known as Ecomouton, (Ecosheep in English), currently has 260 sheep working the premises of top companies such as Gaz de France. 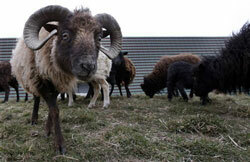 Ecomouton plans to expand that number to more than 600 sheep by the end of 2013. Its director, Sylvain Girard, said he’s surprised by the initiative’s success, with interest coming in from countries such as the Britain, Germany, Belgium and Russia. He’s said the idea came to him by chance. From London’s Daily Telegraph, The NY Daily News and the Associated Press.